From April through October, Travel Calabria offers the 5 day / 4 night Discovering Calabria Through Taste Tour, designed for foodies and anyone else who wants to experience the deliciousness of Calabria via time spent in Badolato, Squillace, and Serra San Bruno. Benvenuti in Calabria! Arrival of the group at Lamezia Terme airport and transfer to the hotel. Welcome drink. Rest of the day at leisure. Dinner and overnight. Buffet breakfast. In the morning you will enjoy a three-hour walking tour of BADOLATO, an old medieval village perched on a hill at 250 meters above sea level. Visit of the Monastery of “S. Maria degli Angeli,” the Church of Santa Caterina, the Church of Immacolata, and the Bell Tower. Short stop for a tasting of local products at a “catojo,” a typical local wine cellar. In the afternoon a visit of a vineyard with wine tasting, followed by a dinner of local food. Return to the hotel and overnight. Buffet breakfast. Today, you are going to cook! 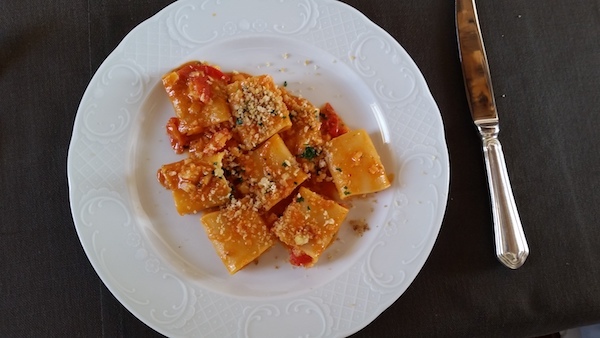 In a local restaurant of Badolato, you will cook some typical Calabrian food followed by lunch. Then you will go to SERRA SAN BRUNO, home of the famous “Certosa di San Bruno.” Guided tour of the historic center and the its churches. Return to the hotel and time for relax. Transfer to a local restaurant of the old medieval village of Badolato for dinner. Return to the hotel and overnight. Breakfast. In the morning we depart for the “Archaeological Park of Calabria” for a short visit to the ruins of Skylletion, one of the most important cities of Magna Grecia, surrounded by old olive trees. Visit of the old town of SQUILLACE, situated on a hill at 344 meters above sea level, also known for the craft of pottery and ceramics. Lunch in a farmhouse in PIETRAGRANDE. Relaxing time on the beach of Pietragrande. Transfer to Badolato, farewell dinner and overnight. Buffet breakfast, check out, transfer to LameziaTerme airport and end of our services.